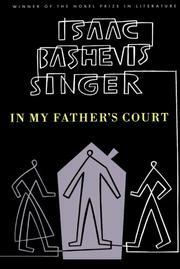 Isaac Bashevis Singer's recollections of No. 10 Korochmalna Street in Warsaw where his father officiated as a rabbi and took on the legal duties of that estate, offers him ample opportunity to give scope to his portrayal of ghetto characters. A shaman at storytelling, Singer writes of the determined sacrifice of an elderly wife for her equally elderly husband which required the bewildered man to divorce her and remarry a young m girl shortly before his death; of Mose Blecher, who wore the look of the Holy Land on his face, and went there, only to return to his old home; the young man with the malevolent wife who came for a dispensation from his marriage only to decide after trudging across the country for one hundred rabbinical signatures to remain in wedded unhappiness; the atheist who blackmailed rabbis for a handout by revealing his wickedness and leaving the community only when remunerated. Singer's own experiences--the, day he saw the Vistula, the trip to Bilgoray to visit his mother's relatives, where he saw a girl with dark eyes and knew that he was ready for "love"--are effortlessly interwoven with the tales of neighbors. Effortlessness is a quality of Singer's writing, as is its endemic richness- and the rightness for its material, and it reads with as much ease as it appears to be written.